We took a look at our 7-string chart and decided to make some small adjustments to reflect recent changes in the market. We removed the ESP LTD M-17 and instead added two new models, including the midrange Sterling by Music Man John Petrucci JP70 and the super-affordable Jackson JS22-7 Dinky. Do I Still Need a 6-String Guitar? Looking for your first 7-string guitar? Or what about an upgrade? Whatever market you are in, you’ve come to the right place! We’ve put together a chart highlighting the best 7-string electric guitars on the market, as well as a brief guide to the basics of this versatile instrument. While it’s an essential piece of kit for heavy rock and metal guitarists, the 7-string guitar actually has its roots in jazz. In fact, the first regular-production model arrived towards the end of the 1930s, originally made for swing and jazz guitarist George Van Eps – known as ‘the Father of the Seven-String Guitar’. These days, similar guitars are still very popular with jazz musicians. However, when it comes to modern, solid-body electric guitars, the first mass-produced 7-string model arrived in the early 1990s – the Ibanez UV7, a Steve Vai signature model. Since then, these instruments boomed in popularity, especially as bands like Korn, Mushroomhead, Trivium and Deftones utilized them to powerful effect. Our chart highlights a handful of models that span all price ranges – from under $200 right up to those pushing $2,000! Then stick around for a guide to everything you need to know about 7-string guitars. A screaming banshee with premium style and infinite sustain. A high-end metal workhorse from ESP. An exceptional premium 7-string guitar from Schecter. Big playability and style from this John Petrucci signature. A fast, smooth playing experience from this Ibanez 7-string. An affordable 7-string with plenty of attitude. Taking top spot of this list is an all-round incredible 7-string guitar from Schecter, the Banshee Elite-7. While the full review has everything you need to know, we’ll give a few highlights… but where to start? This guitar is full of them! The maple-capped swamp ash body is pretty unique with a through-body maple/walnut neck that’s incredibly playable. This offers an ebony fretboard with 24 extra jumbo frets. Great woods aside, another highlight of this model is the Sustainiac pickup at the neck, which offers great tone and endless sustain thanks to clever use of magnetic fields. Controls are ample and the hardware stands up to the test. This is a performer’s dream – versatile, reliable and beautiful. With the E-II Horizon FR-7 from ESP, the Japanese brand put the focus on versatility and reliability just as much as metal mayhem – and that’s a good thing! This high-end model is just sensational to hold, play and listen to. With two finishes available, this double-cutaway guitar sports a solid alder body with a maple top and a maple neck. This neck features an ebony fretboard and 24 extra jumbo frets, with a fast and comfortable hand feel. Awesome. As we highlight in the full review of the ESP E-II Horizon FR-7, it’s fitted with two powerful EMG 707 active pickups for some seriously beastly tones. Components are equally high-end and ensure this reliable 7-string guitar is one that’s built for performance. While you have to fork out quite a chunk of cash for the Schecter Hellraiser C-7, it’s worth every penny – as we happily declare in the full review. The reason this 7-string is top of our chart is the combination of solid build and smooth playability, with a range of components and features that deliver the wow factor. With two beautifully glossy color choices, the C-7 features a double-cutaway mahogany body with a quilted maple top, a three-piece mahogany neck, rosewood fretboard and a full 24 frets. Hardware includes two excellent pickups – an EMG 81-7 at the bridge and a Sustainiac at the neck, while a variety of controls allow you to experiment with intensity, feedback and infinite sustain. Who’d say no to that?! Guitarists wanting a flavor of John Petrucci’s famous Music Man signature models can enjoy a true taste with this fantastic 7-string version of his original axe, featuring a more wallet-friendly price tag thanks to Sterling. In terms of design, it’s top-notch and has a unique eye-catching style. It features a solid basswood body sporting the distinctive ergonomic scooped arm contour, along with a slim hard maple neck and a 24-fret rosewood fretboard sporting the custom JP inlays. The humbuckers are SBMM stock, but do the job asked of them, providing beastly metal tones when dirty, but surprisingly warm and jazzy sounds when clean. There’s more on the JP70 in our full evaluation. Sitting in the affordable under $500 price range, this RG7421 is an awesome 7-string guitar, great for players of all skill levels. 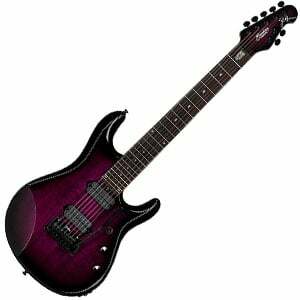 It shows off Ibanez’s famous RG Series shape, which has equal measures of comfort and attitude, with a deep double-cutaway body made from solid mahogany, finished in a range of color choices. The RG7421 shows off exceptional playability thanks to the sturdy Wizard II-7 maple neck, with a slick rosewood fretboard and a full 24 jumbo frets – a shredder’s dream. As for sound, it’s pretty good, with two Ibanez-designed Quantum humbuckers at the bridge and neck. As we highlight in the complete review of the RG7421, for stock pickups you can’t complain! The most budget-friendly model on this list comes from Jackson, who add a seventh string to their respected Dinky body shape to create the JS22-7 Dinky – which is reviewed in full here. For an affordable price, the build is impressive, with a solid, arched-top poplar body finished in a stealthy matte black. This features a sturdy bolt-on slim maple neck with a 24-fret amaranth fretboard and compound radius, which is fast and a pleasure to play. It’s fitted with two Jackson-designed humbuckers at the bridge and neck that aren’t anything special, yet do the job required. 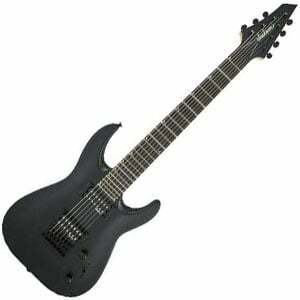 Ultimately, the JS22-7 Dinky is great for 7-string beginners or modders wanting a new project. As obvious as it sounds, a 7-string guitar is basically a 6-string guitar with an additional thick string (a low B) just above the low E.
Some players worry that playing such guitar will be like trying to learn a new instrument, with new notes, chords, tunings and scales. The good news – it’s not! Just remember that anything you can play on a standard guitar, you can play on a model with one extra string. Essentially this extra string only adds five extra notes. That’s it. As you get to the fifth fret of the low B you arrive at your low E, and the rest of the guitar offers the same notes as you are used to. As for playing, it’s technically no different either – playing a powerchord is the same, playing a scale is the same, playing something with drop-D tuning (which would now be drop-A) is the same. It will just involve a lower sound if you utilize the B string. A 7-string will also look pretty much the same as a 6-string, although the neck will naturally be a little wider. For example, looking at a Schecter’s Hellraiser, on the 7-string model the nut width is roughly 1.87”, compared to a slimmer width of around 1.63” on the 6-string. You will also find that a 7-string guitar will have a slightly bigger scale length – around 26.5” compared to 25.5”, although every manufacturer and model is different. Better quality guitars meaning less chance of ending up with a dud! ‘So, if a 7-string can do everything a 6-string can… can’t I just sell my 6-string?’. Well, it depends on how often you play, what style of music you play, and where you play. However, our general advice is to keep hold of that 6-string guitar. Say you’re playing a rock song that was written for a 6-string guitar, and is performed in standard E tuning. While you can indeed play this song on your guitar, it’s easier said than done. If, like us, you really attack the strings, you’ll either have to be insanely accurate to avoid that low B, or you’ll end up hitting it and giving the song a note it doesn’t need. If you are a gigging guitarist, then you’ll also want to hold onto your 6-string. Playing a set including a mix of tunings? Do you really expect the audience to wait for you to tune down from E to B, then back up? A 7-string guitar is another tool that every serious guitarist should consider adding to their arsenal – but not at the expense of ditching a 6-string. As we’ve said on other pages across GuitarFella, buying used allows you to grab a bargain and can be a great idea – if done with care. And when it comes this type of guitar, things are no different. Just be aware of the risks, and ask the following questions: Do the electronics work correctly? Has the guitar been damaged in any way? Can I test it properly before buying? What happens if I want to return it? Our advice is to purchase the instrument from a reputable online or physical guitar store, where you’ll be covered with a good returns policy should something go wrong. Buying a 7-string guitar is an exciting move, whether you are a newbie to guitar, an experienced 6-stringer looking for more depth, or an existing 7-string player in need of another model. We’ve seen that everyone from jazz players to full-on metalheads love the sound that these instruments can produce. The models on our chart above will give you a good taste for what’s hot and what good-value looks like in today’s market. Whether you go for them or something completely different is your choice, but make sure to spend some time on your decision – if you’re spending your hard-earned cash, make sure to buy a model that really suits you. If you’re in the market for such guitar, you may also want to check out our chart on the best 8-string models, just in case there’s something there worth your time. Good luck with the hunt for your perfect guitar!